The November issue of Science News, Beyond Spooky, was dedicated to “quantum weirdness”, as they put it (1). I have long had deep affection for this side of physics. Frankly though, the weirder thing for me is how, despite nature’s bio-hoodwink, it is possible to see more than just the tip-of-the-iceberg of reality. Biology requires living things to perceive reality in such a way that promotes survival and evolution. I can’t imagine any biological reason why any living thing would be able to perceive more than that, but living things can and do, as humans have demonstrated. I suspect all living things do so at some level. I can see why biology needs to make it difficult for life to perceive anything but what is necessary for survival. The indistinct and shadowy side of reality conceals itself behind the bio-hoodwink’s effect on living things. In other words, an ability to know, and especially feel, the quantum non-locality connecting ALL things would certainly weaken any competitive instincts driving living things to survive. We’d all easily personify chapter 64’s, Therefore the sage desires not to desire, And does not value goods which are hard to come by. Nevertheless, we can perceive more than we are meant to as science gradually pries open the lids of our ignorance. By science, I mean that essential curiosity that drives us to look around the next corner. Science led us to use stones to crack nuts, to harness fire, to work with clay, to fly to the moon… We can at least perceive shadows of the Big Picture, despite the bio-hoodwink, because we are part-and-parcel of the Big Picture whole (2). 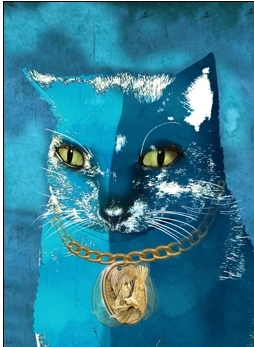 Google, Like fate of cat, quantum debate is still unresolved, by the Editor in Chief, Tom Siegfried for links to the quantum entanglement articles. I’ll paste the introduction here. In the tapestry of 20th century physics, virtually every major thread is entangled with the name of Albert Einstein. He was most famous for the theory of relativity, of course, which rewrote Newton’s laws and set modern theoretical cosmology in motion. But Einstein also played a major role in the origins of quantum theory and in perceiving its weird implications — including entanglement, a mystery named by Erwin Schrödinger in a paper based on an experiment imagined by Einstein. Entanglement is now one of the hottest research fields in physics. 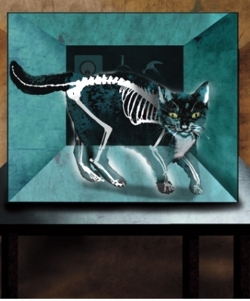 It is pursued not only for insights into the nature of reality, but also for developing new technologies, as Laura Sanders notes in a special section marking the 75th anniversary of Einstein’s entanglement paper (and another quantum legend, Schrödinger’s half-dead, half-alive cat). Despite his contributions to quantum theory, Einstein didn’t like it. He believed that its weirdness indicated an incomplete theory that accounted for observed phenomena but was silent on invisible elements of reality that produced the weirdness. As I describe in this issue, Einstein clashed with Niels Bohr, who found it meaningless to ascribe reality to anything unobservable. Bohr outdebated Einstein, but adherents to Einstein’s views remain vocal today. Today’s debate sometimes gets acrimonious. 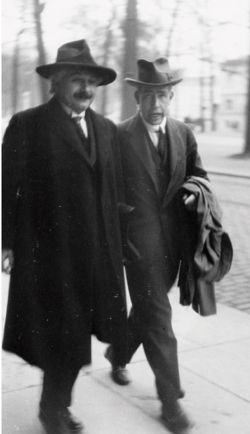 It was not that way with Einstein and Bohr – their disagreement did not erode their deep mutual respect. Their conflicting ideas simply reflected differences in their worldviews, shaped by their personalities and scientific backgrounds. Einstein valued simplicity and clarity; Bohr embraced ambiguity. Einstein was a loner, working for the most part in isolation; Bohr surrounded himself with the brightest physicists of the day at his Copenhagen institute. Einstein’s initial scientific success came from finding unities in phenomena – matter’s identity with energy, for instance. Bohr explained the atom by emphasizing the incompatibility of classical and quantum physics. For Bohr, quantum mysteries such as the dual wave-and-particle nature of light reflected the richness of a complicated universe. Einstein wanted a simpler, unified theory from which complexity would emerge logically, sans weirdness. Physicists have pursued Einstein’s goal within a quantum framework, without much success. It’s unclear whether future progress will come from avoiding quantum weirdness, or by making it even weirder. At the heart of these disputes is the very nature of reality itself, and whether quantum physics is the last word on how to describe it. Zeilinger, of the University of Vienna, advocates the standard quantum view of reality’s fuzziness. “It turns out that the notion of a reality ‘out there’ existing prior to our observation … is not correct in all situations,” he points out. Yet some physicists cling to the prejudice that cause-and-effect determinism will someday be returned to its privileged status, and physics will restore objectivity to reality. The physicists that cling to the cause-and-effect determinism demonstrate the power of nature’s hoodwink. We are neurologically set up to see things that way, obviously, which makes non-locality such a mind-blowing view. The Taoist view expressed in chapter 1, These two are the same, but diverge in name as they issue forth, and chapter 2, Thus Something and Nothing produce each other, would seem to slam the door shut on ‘cause-and-effect’. ‘Cause-and-effect’ offers a linear view of reality, while “produce each other” offers a circular one. One I might add that is more consistent with “quantum weirdness”. It is fascinating how folks millennia ago, with only intuition guiding them, could realize what modern scientists with high tech instrumentation can now verify. Seeing through nature’s hoodwink takes time, and having the verification certainly helps. Zeilinger, on the other hand, does not expect the future to return physics to the past. It is more likely, he suggested at the Turin conference, that an advanced theory going beyond today’s quantum mechanics will be even more counter­intuitive. I regard the Taoist world-view to be one that goes “even beyond quantum physics”. Why? Because it acknowledges the essential role of Nothing and weakness that chapter 40 notes. Up to now science only allows itself to deal with the ‘something’ side of reality. This is necessary for now, but eventually science must recognize the other side of the coin. The other article to Google is Everyday Entanglement: Physicists take quantum weirdness out of the lab. I’ll paste a few choice excerpts and my comments. The first revolution peaked when Austrian physicist Erwin Schrödinger introduced the term entanglement (a translation of the German Verschränkung) in a 1935 paper, inspired by a thought experiment proposed the same year by Albert Einstein and collaborators Boris Podolsky and Nathan Rosen. The thought experiment demonstrated that when two objects interact in a particular way, quantum physics requires them to become connected, or entangled, so that measuring a property of one instantly reveals the value of that property for the other, no matter how far away it is. “No reasonable definition of reality” could permit two objects to be mysteriously entwined across great distances, Einstein and his collaborators complained in Physical Review (SNL: 5/11/35, p. 300). There must be more to reality, Einstein believed, than quantum theory described. But rather than undermining quantum physics, the EPR paper, as it became known, became fodder for other scientists who showed that this unreasonable connection was in fact real. If quantum rules applied in everyday life, as soon as Peyton saw his quantum coin land in Seattle, he would know the outcome of Eli’s toss — even if Eli’s game were across the country or on the moon. The mysterious entwining between objects across great distances gives some proof to the Oneness that is spoken of in many religions. I see a parallel with the uncarved block in chapter 32, and why that chapter says, only when it is cut are there names. As soon as there are names one ought to know that it is time to stop. Perhaps telling that story requires using a teaching that uses no words. I see the nature of how we think as something standing in the way. It is a fascinating dilemma! Like the heft of NFL players, the size of entangled objects is steadily creeping upward. The superconductors entangled by Martinis’ team are large enough to see with the naked eye. And a blob of thousands of photons and a centimeter-long crystal have, in separate experiments, been entangled with a single photon. It seems that the entanglement occurring on a real world scale freaks some scientists out. This reminds me of how the Catholic Church freaked out on evidence that the earth revolved around the Sun. Historically speaking, that was like yesterday. We are just at the dawn of knowing the world as it really may be. As science bypasses bio-hoodwink influences, this won’t turn out to be the ideal for which we often wish. I beg to differ! The difficulty in modern science is that it requires the story to be based in something solid. This is irresolvable if the true story is what chapter 14 calls, the image that is without substance. In other words, the mystery is the answer; the question is the answer. This entangled way to see the mystery is the way to resolve it. At the end of the day, chapter 10 brings us back to reality… when your discernment penetrates the four quarters are you capable of not knowing anything? (2) How can we have any faith in the possibility of perceiving anything outside-the-box of the biological hoodwink? My best guess is that quantum entanglement influences consciousness at the synapse level. If so, our most subtle perceptions must be entangled with ALL beyond space and time. Such “quantum weirdness” would affect people in numerous ways and would account for some of the “weirdness” found in spiritual myths and mysticism. For example, a universal sense of what chapter 39 calls the virtue of the One (quantum non-locality) links up with the instinctive social (hierarchical) need for an ‘Alpha-male’ (or female) leadership. A resultant emergent property of this is the notion of God, or god-like beings, e.g., Buddha, Krishna, or even Tao (with the sage ideal serving the leadership role). Once you begin losing faith in labels (words, names, language), you are in a better position to sense what chapter 14 calls, the thread running through the way. In the end, nature’s hoodwink can’t totally conceal from an impartial consciousness the sense that we are one; non-locality is reality. Naturally, the ability to feel sufficient impartiality comfortably is the challenge! Hmmmm, will they have to blow something up or implode something using the collider to find out that what they seek is in reality nothing? Just awesome Carl. I love the idea that science cannot move forward until it recognizes the significance of nothingness and weakness, the other side of the coin. I need to take this to my reading spot.